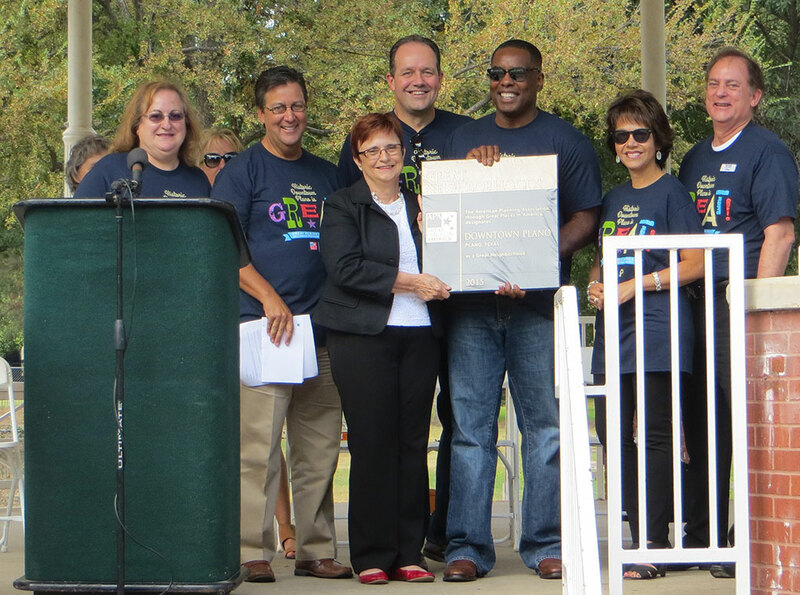 Plano Mayor Harry LaRosiliere and other city officials receive a plaque. Downtown Plano has been recognized as one of the four best neighborhoods in America thanks in part to the presence of DART’s Downtown Plano Station. The American Planning Association and Plano Mayor Harry LaRosiliere both credit DART’s arrival as the beginning of Downtown Plano’s renaissance into a historic and artistic hub. DART opened its Downtown Plano Station on December 9, 2002. Since then it has grown with dozens of restaurants and locally owned shops calling the quaint district home. Downtown Plano has a rich history of visionary home-grown citizens, committed to working in partnership with city officials to create a great place. A robust transit village plan, developed in partnership with the city, residents, community development organizations, and consultants, has reimagined the neighborhood’s functionality and is exemplary of a true planning success story. Congratulations to Plano and we look forward to watching and helping you grow.